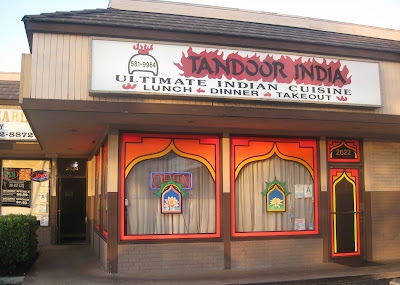 A great value, Tandoor-India offers (mostly) above average Indian food at bargain prices (with free parking!). Date night is a minimum once-a-week ritual in our household, but since we had an entire Date Weekend recently via a friend's wedding in Portland, I was feeling frugal this past Saturday. Actually, before Nick calls me on it I should correct myself. I was feeling even more frugal than usual, if that's possible. The free parking is in a shared lot for the strip mall, which also contains a laundromat and a doughnut shop. Not high end by any stretch of the imagination, but there were several open spots, so I was happy. (There is also tons of parking on Pico, but I definitely saw parking meters there. Not sure what the enforcement hours are on those.) Inside, it is fairly generic with a yellow and orange color scheme, several booths on one side and typical two- and four-tops throughout. There is Indian-styled framed art on the walls. Curtains block busy Pico Boulevard from view, though I would have preferred the windows be uncovered to let in natural light. A deliciously pungent smell greeted us as we walked in, whetting our appetites. Service was fast and cordial, through not especially friendly. The restaurant skimps on some things. Namely, no free papadum and no drink refills. (Or, at least, they never offered one for Nick's soda.) Still, for the prices, it's a great value. 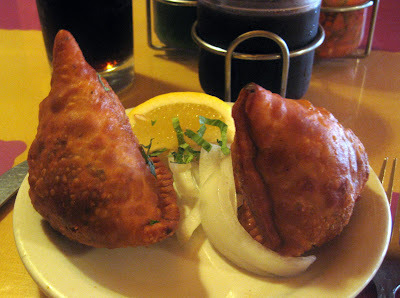 An appetizer order of Keema Samosas came with two large samosas, which were golden crispy on the outside with dark ground lamb on the inside punctuated by a few peas. Nick, the samosa connoisseur, declared them "above average." I revisited the thali (as I recently also opted for at New Delhi Palace) since it seemed a well-rounded representation of the menu. 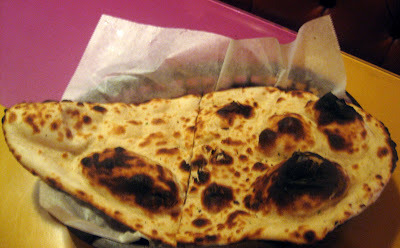 It was $10.50 and included naan and sides. 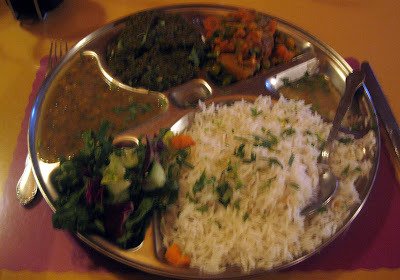 My face fell as I noted the biggest portion went to rice, but I suppose in a way that is authentic. I choose the "Lamb Spinach" option for the meat. The spinach was exceptionally spiced and full of flavor. A few pieces of lamb were tough, but most were tender. The Daal was subtly spiced and delicious. The Salad, which I picked in lieu of Raita, was odd because the dressing was on the opposite side of the plate, and it took me asking a server to figure that out. (I initially though the chef had spilled some drippy liquid on my plate. Gross.) The Vegetable of the Day was a mix of potato, peas, and carrots, and I enjoyed their chunky texture. The naan that came with my combo plate was plenty to share. However, it sported large burnt peaks and was dry. 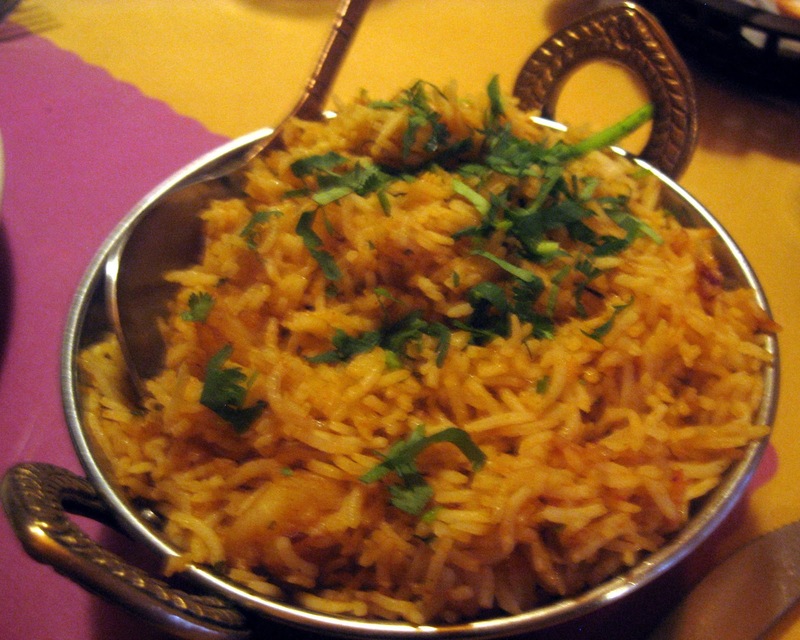 Nick's Shrimp Biryani wasn't spicy enough. Oddly, the server never asked for our preferred spice level on any of the dishes. Biryani is typically one of the spicier dishes though, so Nick was disappointed. On the plus side, he noted that the shrimp tested "fresh." 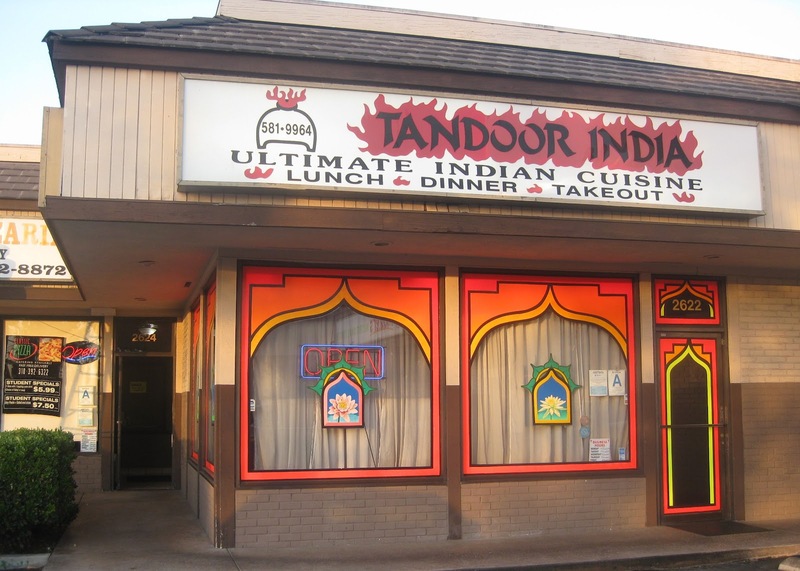 Tandoor India, 2622 Pico Boulevard, Santa Monica 90405. (310) 581-9964. Before you decide to Help to make Any kind of Choice, Think about That which you tag heuer replica uk. The very best guidance you'll need, in order to learn to construct self-belief is actually you have to manage you to ultimately manage your own success. Do not allow anybody stress a person or even convince you to definitely help to make any kind of choice. Even though you concur, you have to have a action back again, have a air, consider the fake watches objectively and enquire of your self, exactly what would you like? Perform Exactly what You wish to Perform. A person learn to construct self-belief through performing exactly what you wish to perform. Regardless of what it's, you have to think it’s great! This doesn't’t issue in the event that other people in the world wants that which you such as, if you such as omega replica, you are able to construct goals as well as total all of them, therefore attaining self-belief! Perform Exactly what You wish to Perform Much better than Other people and End up being Moderate! Everything issues is the viewpoint whenever omega replica sale develop self-belief and also you perform exactly what you wish to perform much better than other people as well as if you have positive results, inform the planet! Existence is actually filled with problems; good and the bad as well as insecurities. The only real assured romantic relationship you've is your self, therefore help to make which romantic relationship an excellent 1! I really hope your own discovered this short article because fascinating as well as strengthening when i do whenever composing this. Residing cartier replica sale Existence within Ahead Movement.